Mhairi Black said that she will “batter in to whoever is in government” after holding the Paisley and Renfrewshire South seat for the SNP. Ms Black, the youngest MP at Westminster in the last parliament, had her majority over Labour cut from about 6,000 to about 2,500, however she still emerged victorious in a closely-fought race with Labour’s Alison Dowling. She denied rumours she had become disillusioned with the House of Commons, insisting rumours of her standing down were “grossly over-exaggerated.” She said: “If anybody was to be told they have a job for another five years, potentially, that’s good news. “When I signed up to be the representative for this area, I meant it. “So I’m glad to be re-elected again to go back down and continue to batter in to whoever’s in government, to tell them that austerity is not working, it’s not benefiting people’s lives whatsoever. 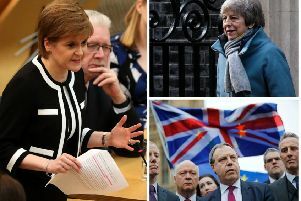 She also refused to rule out the Nationalists forming a “progressive alliance” with Labour, claiming that significant portions of the party’s manifesto is “almost exactly copied” from the SNP.